Copper mineworkers employed by Kazakhmys emerged after three days underground on Sunday after a strike for higher wages. Around 300 miners earlier refused to emerge from the main shaft of the Annensky mine in a region of Kazakhstan that contributes some 70% of Kazakhmys' output. Production at the mine has now resumed. Kazakhmys is the world's 11th-largest producer of the red metal and produces 90% of Kazakhstan’s copper. Last year the company mined 33 million tonnes of the red metal, significant quantities of zinc, 13 million ounces of silver and some gold. Authorities in Kazakhstan, a former Soviet republic of 16.7 million people, are especially wary of labor unrest in single-industry towns after a months-long dispute involving sacked oil workers last year erupted into the country's worst violence in decades. At least 14 people were killed in clashes in December when police used live ammunition against protesters in the remote oil town of Zhanaozen. 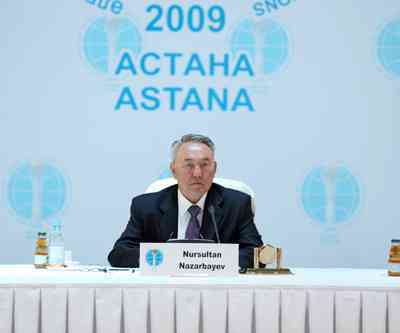 The unrest posed the most serious challenge to President Nursultan Nazarbayev [pictured] in his more than 20-year rule. London-listed Kazakhmys was punished by investors on Friday as news about the strike action emerged, dropping more than 6% by the close. The company, also listed in Hong Kong, is now worth 40% less than a year ago at $6.4 billion as copper prices retreat from historic highs. Copper on Friday traded at $3.72 a pound, some 20% below 2011 highs. Kazakhmys was created by Vladimir Kim, the ex-Soviet republic's richest mand and the world's 33rd richest miner with a net worth of some $3.5 billion. When Kim got involved with Kazakhmys (then called ZhezkazganTsvetMet) during the 1990s the Soviet era the state company was in complete disarray and debt laden. Revenues last year came to $3.6 billion and profits a healthy $1.2 billion. Kazakhmys was brought to the London market by controversial City wheeler-dealer Ian Hannam, aka ‘the king of mining M&A’. Hannam in April resigned as head of JPMorgan Capital Markets and is fighting to save his reputation after being fined for passing on confidential information of an oil deal he was advising on.